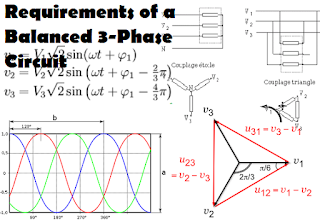 Following are the requirements that must be satisified in order for a set of 3 sinusoidal variables (usually voltages or currents) to be a "balanced 3-phase set"
In terms of the time domain, a set of balance 3-phase voltages has the following general form. Notice that we have assumed (and will continue to assume) positive (abc) phase sequence, i.e., phase "b" follows 120obehind "a" & phase "c" follows 120o behind phase "b"
Figure 1 below illustrates the balanced 3-phase voltages in time domain. In terms of phasors, we write the same balanced set as follows. Note that the phasors are in rms, as will be assumed throughout this course. 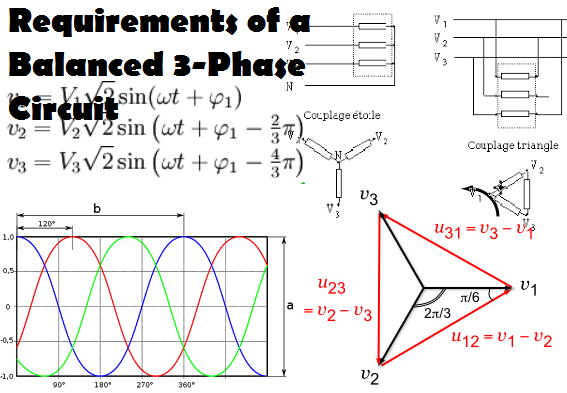 Figure 2 below illustrates the balanced 3-phase phasors graphically. Having a balanced circuit allows for simplified analysis of the 3-phase circuit. In fact, if the circuit is balanced, we can solve for the voltages, currents, and powers, etc. in one phase using circuit analysis. The values of the corresponding variables in the other two phases can be found using some basic equations. This type of solution is accomplished using a "one-line diagram", which will be discussed later. If the circuit is not balanced, all three phases should be analyzed in detail.